Hand-painted scene of a banana tree. Great for patio, lawn, or beach furniture. The canopy of this beautifully hand-crafted umbrella is made of lightly lacquered Rayon for waterproofing to insure durability during rain or shine. 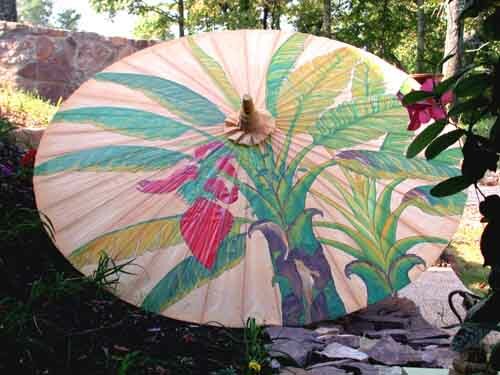 The artistically hand-painted scene on this umbrella is of a banana tree. I also have several designs , email or call 1-800-321-8618 to see the others. 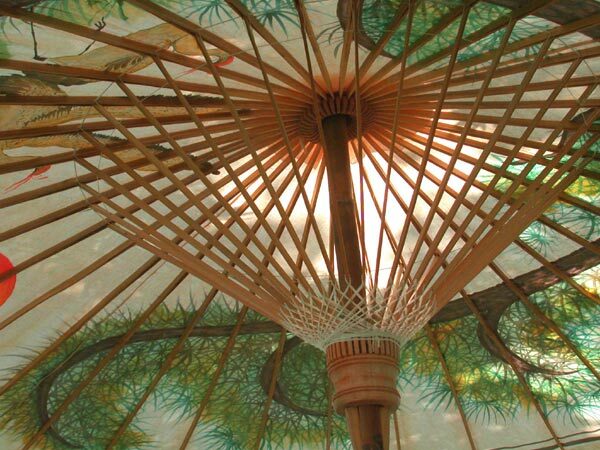 The canopy is stretched over a sturdy bamboo frame. This umbrella also looks great inside ! I have one at the end of a daybed. The umbrella comes with a carrying case made of 100% cotton which makes it handy for you to take to the beach. Or it can be used with most picnic tables that are made with a two inch whole for use with an umbrella. You can replace an ordinary umbrella with this unique hand-crafted work of art that opens to a large 6.5" diameter. If you don't want to use it with a picnic table we will furnish a free bamboo stand for an additional $14.00 for shipping. The additional shipping cost is necessary as the stand will have to be shipped in a separate box. This is a very special piece and a great addition for outdoor setting.